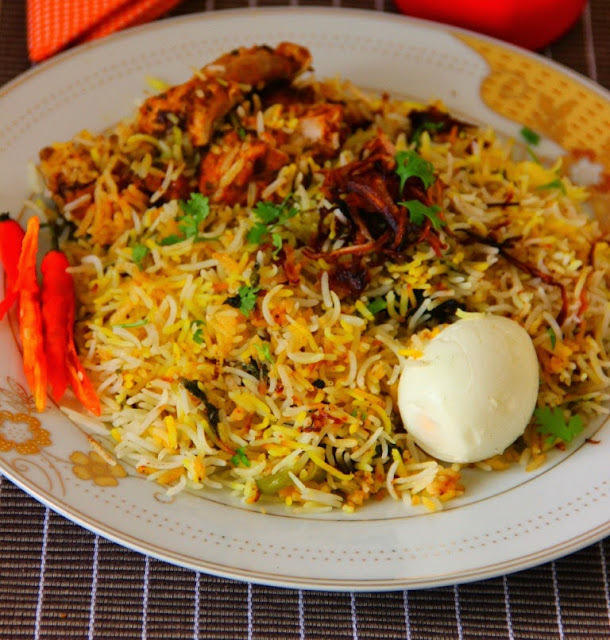 Hyderabadi Biriyani is so special and popular amongst all Biryanies. 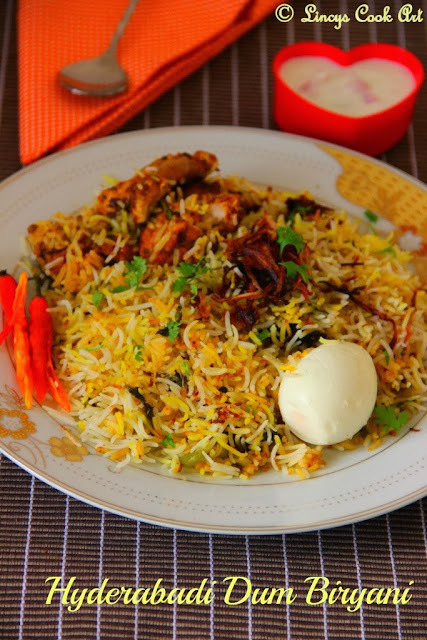 Hyderabadi Biryani is of two types: the Kachchi (raw) Biryani, and the Pakki (cooked) Biryani. The Kachchi biryani is prepared with meat marinated with spices and then soaked in yogurt before cooking. The gosht (meat) is sandwiched between layers of fragrant long-grained basmati rice and is cooked on dum (steaming over coals), after sealing the vessel with a layer of dough traditionally. The Pakki biryani, the meat is marinated for a shorter time, and is cooked before being layered with the rice and cooked in a dough-sealed vessel. In Pakki Aqni (with cooked gravy), the ingredients are cooked before baking. Fry the onions in a cup of oil and keep the remaining oil in the same vessel. Marinate chicken in that same pot with some fried onions, onion cooked oil (if oil is less after frying onions add some more oil. Minimum 1/2 cup of oil should be there for marinating the chicken otherwise chicken stick to the bottom and masala will burn), red chilli powder, ginger garlic paste, garam masala powder, green chillies,coriander leaves, mint leaves, salt and yoghurt. Mix every thing well and allow to marinate for half an hour. Mean time half cook the rice with salt and raw garam masala. Drain the excess water and allow to cool. Inside the sauce pan containing marinated chicken, layer half of the cooked rice on top of that then sprinkle fried onion, some garam masala powder, jeera, green chillies, coriander, mint leaves, butter and lime juice. Again layer the rice and do the same and sprinkle lemon juice. 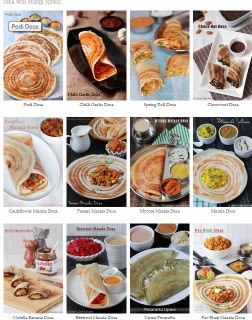 On top of that add the saffron/ turmeric/ food colour dissolved milk in a circular motion. Cover this with aluminium foil/ dough to keep it air tight. Close the lid and keep some weight on top of that. Allow to cook for 35-40 mts in low flame on stove top or microwave or cook inside the gas oven. Serve with Onion Raitha and boiled egg. That biryani looks heavenly Lincy well done! looks awesome lincy very inviting dear..
Yummy! Need to try this one for sure. Biriyani looks awesome, you have made them very professionally, do you stay at Hyderabad? 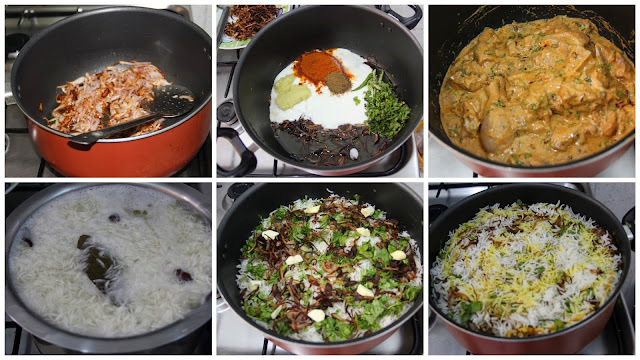 Biriyani looks delicious, thanks for sharing with favorite recipes: christmas recipes event. Hi.shoould we cook the marinade before adding the half cooked rice? No need to cook the chicken in marinade as the chicken cooks fast and we do dum cooking. BUt you can cook the chicken for 5-10 minutes in marinade if you like but reduce the time for the dum process to 15 minutes.